In 1994, total uranium resources of mines run by Kaskor were estimated at 64,400 metric tons of uranium. "In Steppe with Kazakhstan," Nukem, 1995, p. 12. "National Joint-Stock Company of Atomic Energy and Industry 'KATEP,'" Marketing brochure, 1994, p. 6. 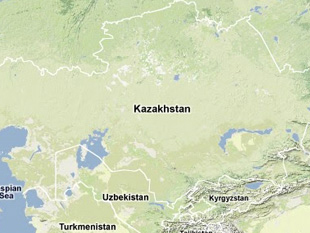 Vitaliy Ponomarev, "The Nuclear Industry in Kazakhstan and Kyrgyzstan," Central Asia Monitor, No. 2, 1993, p. 33. Olga Kovalenko, "Peretyagivaniyem kanata, a ne resheniyem ekonomicheskikh problem zanimayutsya v Aktau," Kazakhstanskaya pravda, No. 217 (22174), p. 1, 4 October 1996. BISNIS Trip Report to Aktau, 18-19 October 1999, BISNIS, www.bisnis.doc.gov. Vitaliy Ponomarev, "The Nuclear Industry in Kazakhstan and Kyrgyzstan," Central Asia Monitor, No. 2, 1993, pp. 32-34. "Kaskor Suspends Production at Shevchenko Site," Nuexco Review, February 1994, p. 11. William C. Potter and Elizabeth Skinner, Interview with Vladimir S. Shkolnik, Director of the Atomic Energy Agency, Republic of Kazakhstan (AEA RK) 16 April 1994. "Eurasia", Nuexco Review, 1992, p. 60. Olga Kovalenko, "Peretyagivaniyem kanata, a ne resheniyem ekonomicheskikh problem zanimayutsya v Aktau," Kazakhstanskaya pravda, No. 217 (22174), 4 October 1996, p. 1.